HMS Queen Elizabeth: What is Hurricane Florence? And is the Royal Navy carrier in its path? A ‘life-threatening' hurricane is close to making landfall on the East Coast of America today. The category two Hurricane Florence could ‘kill a lot of people’ the Federal Emergency Management Agency (FEMA) have warned. HMS Queen Elizabeth arrived in Mayport, Florida, on the East Coast of America last week for a re-supply drop before heading further north for historic flight tests. A type of storm, a hurricane – known as a tropical cyclone – forms over tropical or subtropical waters. It is a rotating low-pressure weather system, when it reaches speeds of 74mph then it is called a hurricane. Hurricane season begins on June 1 and lasts until November 30. While Hurricane Florence has been downgraded to a category one from a category four but is still ‘very dangerous’, officials have warned. 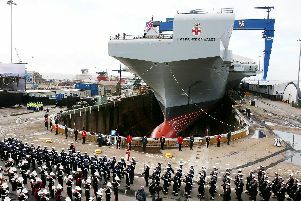 Is HMS Queen Elizabeth in its path? Hurricane Florence is currently close to making landfall in North Carolina – with flash flood warnings in place in the state today. However the hurricane is not going to hit Mayport, so the HMS Queen Elizabeth and her crew will be safe – as NC is hundreds miles north of Florida. But Naval Air Station Patuxent River, Maryland – where the flight tests will take place – could be in the path of Hurricane Florence. The local government – St Mary’s County – were distributing sandbags in the area earlier this week and the navy base issued a warning on Facebook. They wrote: ‘NDW has instructed all Navy installations in the region to set Tropical Cyclone Conditions of Readiness IV. ‘TCCOR IV means destructive winds of 50 knots or greater associated with a tropical system are possible in the NDW AOR within 72 hours.